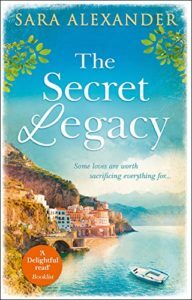 The Secret Legacy by Sara Alexander is an epic historical family novel that transports the reader to 1950’s Italy. Wonderful comprehensive descriptions bring the landscape to life for the reader. We are enveloped in warmth and sunshine, with expectations of laughter. The novel is about love and loss, sacrifice and letting go – knowing when to step forward and when to hold back. there are loves that consume. One is obsessive to the exclusion of all else, the other bubbles away in the background. There is the difficult theme of mental illness. It is managed with love, care, kindness and gentleness. Love sometimes means letting go. Letting go of your hopes and dreams. A sacrificial love, prepared to watch from afar. The Secret Legacy took over my life as I read with bated breath about love, family and loss. It is a beautiful novel in its themes and setting, just perfect for any time of year. Let yourself escape to sunny Italy for a few hours.